Matt Bonilla, seen at his home in Aiea, is recovering from injuries sustained in a hit-and-run last Sunday. For the past week, Frank Bonilla has been in anguish trying to understand why a driver would hit his teenage son and flee without helping. "Why you never stop? That's what I'll ask the driver," the father said. "You run over a can and you can feel it. This was a boy." 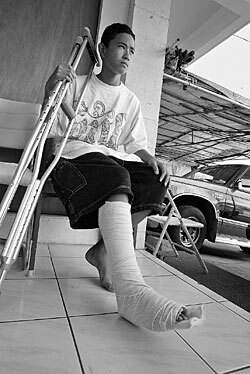 Aiea Intermediate School student Matt Bonilla's case was one of three hit-and-run accidents just this month. » On Oct. 19, two Schofield Barracks soldiers were fixing a flat tire on the H-1 Freeway between the airport ramps when they were struck by a car. The two men, ages 18 and 20, were hospitalized in serious condition. » On Oct. 1, a woman in her 90s was struck by a vehicle backing out of a parking stall at the Iwilei Kmart. She broke her hip, police said. At about 7:30 p.m. last Sunday, Bonilla was walking in a crosswalk across Kamehameha Highway toward Aiea Kai Place, when a gray or silver sport utility vehicle traveling Ewa struck the boy. "A bright light shined in my eyes, and I couldn't see," said the boy, who yesterday was in crutches with his leg wrapped in bandages. "It whacked my back leg, and I flew 5 to 7 feet. I couldn't feel my leg, and I cried out for help." This year police opened 16 cases investigating accidents where drivers failed to render aid. None involves fatalities, and three of those were closed because they were unfounded, said police Maj. Susan Dowsett, head of the Honolulu Police Department's traffic division. Last year there were 25 felony failure to render aid cases. Felony cases involve deaths and bodily injuries, according to Hawaii law. "We investigate usually a few thousand leaving-the-scene type of cases a year," said Dowsett, adding that most of them are misdemeanor cases involving damage to vehicles or property. Last year there were 2,702 such cases, and in 2005, there were 2,877. From January to June this year, there have been 1,286 cases, she said. Police have said witnesses are key in leading to arrests and prosecutions, and drivers often flee because of fear of prosecution. Matt's mother, Jane Bonilla, said she is angry. "Frank and I are offering a $2,000 reward for information leading up to a conviction," she said. Skin from the boy's right leg was burned off from the vehicle's tire. He also has an inch-deep gash, nerve damage and broken bones. It'll be several months before he can walk again, the parents said. Jane Bonilla has warned her other children not to cross Kamehameha Highway at that crosswalk, especially because it has no lights. Matt said he hopes to recover fully before high school so he can play football. He also added that he has only one thing to say to the driver that hit him. "Just turn yourself in," he said, his broken leg propped up on a chair.